﻿ Taller Móvil Seat - SEAT Mobile Service Unit by Velyen | Velyen - Equipamiento de taller. Fabricante de elevadores. SEAT have unveiled its first pilot of Mobile Service Vans, which will save customers money by reducing downtime and enhances the customer service experience. “Cerca de todas partes”, if the customer can’t come to our business, we will run to meet them. The Mobile Service Units, part of a SEAT-VW-SKODA group initiative, a “Workshop on Wheels”, have been designed and equipped to be capable of delivering service work: inspections and diagnostic, A/C servicing, MOT repairs, minor warranty work and software updates remotely, rapid oil changes, etc. Of course equipped with tools box, storage tanks, emergency lamps, first Aid Box, fire extinguisher, etc. Seven more Mobile Service vans are expected to join the network by spring 2018. #Velyen, specialized in after sales workshop equipment, equips the first unit for the #SEAT after sales team. 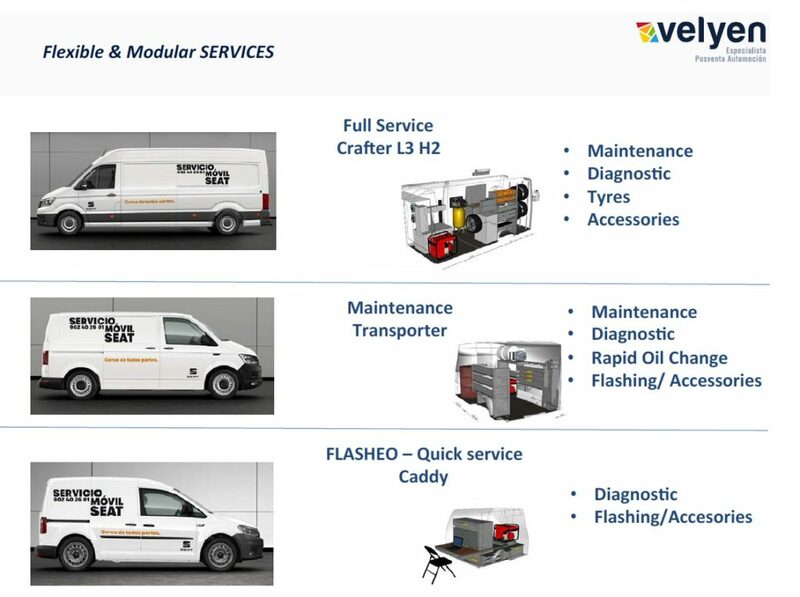 This mobile workshop offers the main after-sales services, is 100% connected and digital, as well as being designed on a flexible and modular concept (Caddy-Transporter-Crafter) that allows #SEAT to offer new added value services from after sales department. Velyen were pioneered with Mobile Service in late 70´s building its first MS (Mobile Service) for NATO purpose, by then Istobal branded. We wish #SEAT many success . Thank you for your trust and confidence.